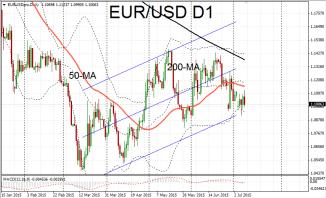 EUR/USD was trading under the key support at the 50-day moving average line. 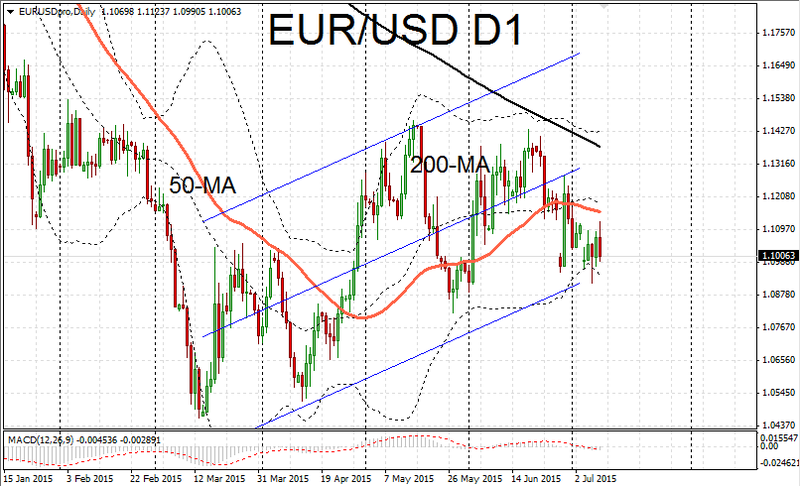 A break below 1.1010 precipitated further selling pressure and a fall down towards the lower support level at 1.0983. Momentum was lacking after yesterday’s brief rally failed to follow through with a clean break above 1.1100. German exports were up again in May according to latest figures from Destatis. Exports beat the outlook by rising to 1.7% in May. Economists had predicted a small fall of 0.6%. As a result the trade balance improved to make a 22.2B euro surplus on the month. An EU summit will take place on Sunday at which all 28 leaders will meet to discuss the Greek crisis. The debt stricken country is due to submit a new proposal on its structural reform plans. It is hoped this will convince European creditors to offer further financial assistance. Greek banks are teetering on the brink of collapse and without such an agreement an exit from the single currency union and return to the drachma appears the most likely outcome.